Bike-to-Metra Pamphlet for LaGrange IL. Our RL villages ought to get together, along with the Round Lake Area Chamber of Commerce, to think about the marketing potential of a professionally-produced “Bike-to-Metra Guide” for our villages, especially in light of the Millennium Trail passing through RL & RLB. Since there’s not much PR for our area, this could be a great (i.e. : mostly subsidized!) way to let recreational cyclists and day-hikers know about opportunities and connections we offer, and others who want to learn more about our area, esp. the wonderful access to the Lake County Forest Preserves. If you’re a typically car-dependent couch-potato, this might not seem enticing (or even logical) to you, but a growing number of people are looking for opportunities to visit other communities, and to walk / shop / hike / cycle without having to endure traffic and a lengthy drive to get there. It works the other way too: in our group members use a Metra $7 Unlimited Weekend Pass to do things like ride up to the VFW in Lake Villa, enjoy downtown Antioch and Libertyville, and Deerfield for restaurants, shopping trips, and more. You can bring your bike onboard the train and enjoy riding around these other villages as well! 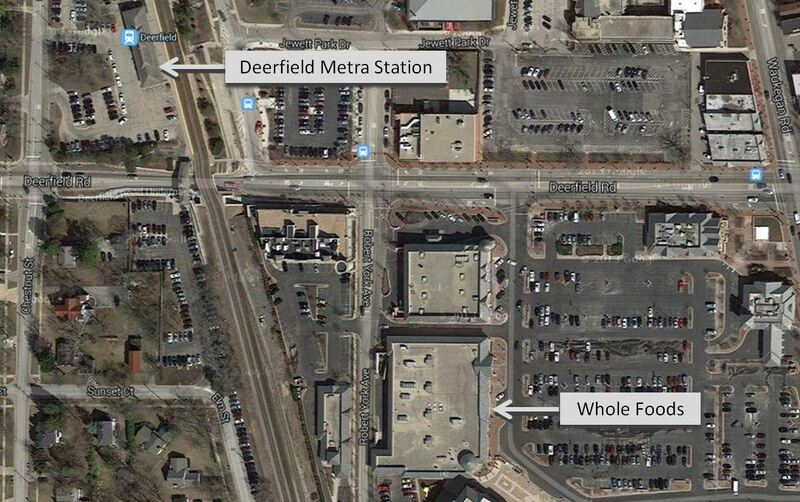 Did you know that a Whole Foods is just 2 blocks from the Deerfield Metra station? BTW… we know several moms-of-toddlers who are looking forward to taking “field trips” by train from RLB up to Lake Villa to visit the Busy Brains Children’s Museum when it opens. This may sound like we’re recruiting you to go everywhere BUT our Round Lake area; what it’s TRYING to say is how accessible a lot of pedestrian-friendly places are using Metra from Round Lake Beach. Even the best-planned, most-complete town can’t contain EVERYTHING for its residents. It’s not an “us-versus-them” all-or-nothing situation… part of what makes a community appealing is its proximity to desireable areas and activities. This entry was posted in Bicycling, Millennium Trail, Transit, Walkability. Bookmark the permalink.